...and they're more than willing to admit it. 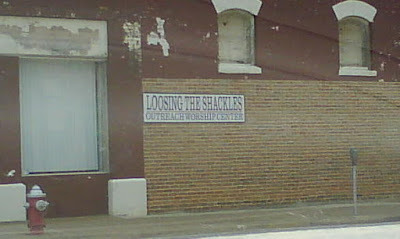 Apparently this downtown church is willing to loosen the old shackles just a wee bit if they're hurting you -- but they are in no way interested in having you remove them. You might escape. I think they just don't know how to spell. It would be correct to "loosen" or to 'be' "loosening" the shackles or to "lose" the shackles entirely. Blame the lack of standards in education ... some deliberate mis-education, in addition to teachers, students, and of course, the evil administrators. I care not to tell how many times I have seen this spelling/grammar blunder. Yet, the tax money just flows and flows into the coffers of the local school systems. I'm sure you (Spork) can remember how you and I had to correct some of the 'teachers' during our days in Hell. It is NOT a negative number... it's simply a number less than zero. oh, and yeah. I figured they didn't know how to spell "losing." That's what made it funny. "If you show it to me in a book, then I'll believe you..."